Cruising the canals of AmsterdamAmsterdam has 165 canals spanned by more than 1,200 bridges, so no trip is complete without a boat trip on a canal. Hop-on/hop-off Canal Bus (think of it like a city bus or ferry, making regular stop on a set rounds; as such, it is covered on its own page in the "getting around" section). 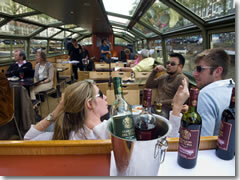 Canal cruises in a glass-roofed boat with multilingual commentary. There is no better way to get a feel for this city or to see its gabled houses, lithe bridges, busy harbor, and some unforgettable sights (such as the unlikely Cat Boat, home to about 150 of the furry felines who are supposed to detest being anywhere near water). Similar tours are operated by more companies than you could shake an oar at, so here are just a few: Blue Boat Company (tel. 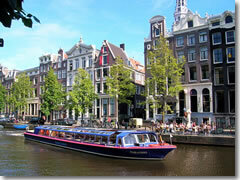 +31-(0)20-679-1370, www.blueboat.nl) Amsterdam Canal Cruises (tel. 020-626-5636, www.amsterdamcanalcruises.nl) and Holland International (tel. 020-625-3035, www.hir.nl). This article was by Reid Bramblett and last updated in May 2011.